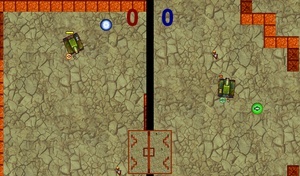 Tank War is a fun multi-player shooting game where you play as tanks. Travel around the small maps to find your opponent and defeat them, there are various power-ups available to use to defeat your opponent. Tank War is one of the nine games Revolution Games did not create. They were originally created by Mark Overmars, and Jacob Habgood for The Game Maker's Apprentice.